FM transmitters need a driver stage which converts the audio into a low power radio signal which is then amplified for broadcast. The driver stage needs to be stable as the whole transmitter warms up (so the station doesn't drift). By using some very clever low current design in the initial stages, excellent voltage regulation (LM723) and a very high impedance amplifier (the now obsolete 703 chip) the Thameside Radio FM2 driver was amazingly stable. 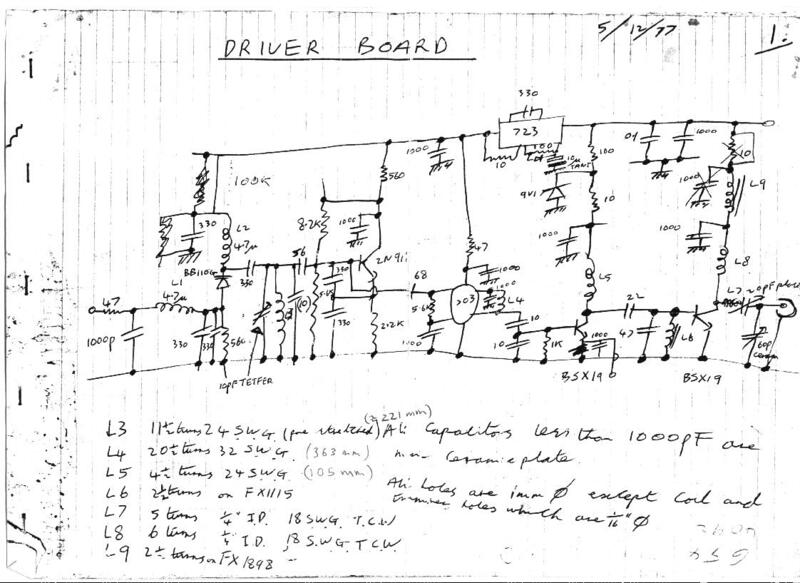 While many radio station built their drivers (exciters) from scratch each time one was needed Richard Courtenay actually designed a standard circuit board. This meant that the drivers were easy to build and would all work reliably and repeatably. These days you can buy driver boards (also known as exciters) over the internet which have microprocessor control. They're fairly cheap, easy to build and and just as stable so it's probably not worth copying this particular design. But this was the state of the art in 1977. The Thameside Radio Story is an achive of material about Thameside Radio 90.2, a London pirate station. It broadcast between 1977 and 1982. Tony Lloyd, Bob Edwards, The Intrepid Birdman, Alex Wright, Paul James, Ian Stewart, Terry Anderson and The Curly Man all presented shows, as did many others. More important were the listeners. This is a live site so if you would just like a namecheck, want to get in touch, have a Thameside Radio 90.2 related photo, Thameside Radio recording or a memory please email me. Special thanks for mp3s, writing in or sending pictures to (amongst others) , Carol H, Olaf Star, Jessica D, Pyers E, Warren S, Stephen Sykes, John G, Mike E, itrilby for Radio Eric, Alex Wright, Aidan S, Dave "The Birdman", Alan Dolby, Rachel McIntyre (for Terry Anderson), Al at fmthen.com for the Thameside Radio Revisited podcasts, Terry/Decibel90 and Steve Scribbler. I know that a lot of Thameside listeners and friends would like to get in touch with each other again. If you are happy to have e-mail forwarded do write in. Even if you don't have any new information it would be great to hear from you. The content of this site is avalilable under the Creative Commons Attribution-ShareAlike 3.0 Unported License.